We've all experienced the frustration of seeing a beautiful color clothing that while the cut looks amazing, the color doesn't quite flatter us. Maybe you've found yourself wondering why you can't seem to pull off a red lipstick? Color is chaotic, confusing, and deceptive. Two lipsticks that look almost identical can look completely different when applied, so what do we do in this world? Swear off lipstick? Never wear another color again? We don't think so. 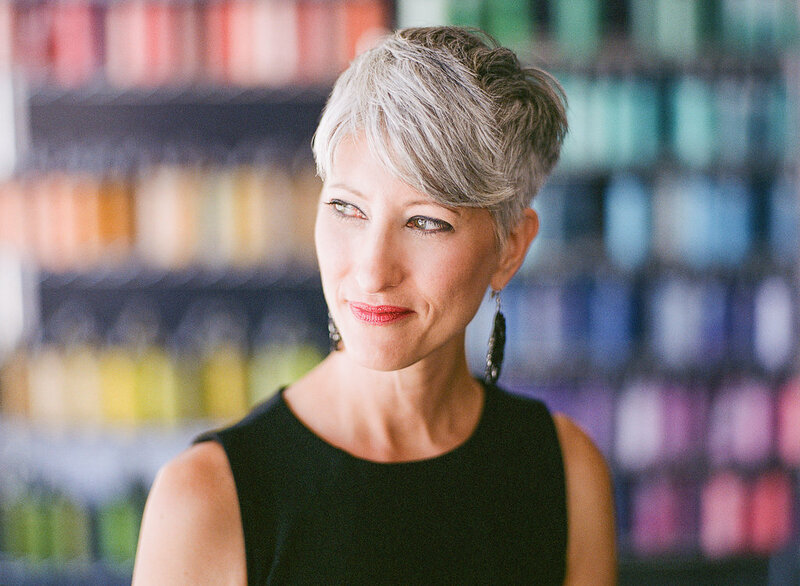 When Darin Wright founded elea blake in 1997, she created her line with the mission to provide each person the perfect tone of foundation to match their skin. When everyone, but especially people with “non-mainstream” skin tones were forced to choose between foundation colors that just didn’t match, Darin created a custom mineral makeup line that took its lead from the skin – not the other way around. It has been 21 years since elea blake’s humble beginnings and in that time we have created a rainbow array of colors in every medium for every person looking to individualize their makeup. ebhues is the only personal color analysis system rooted in science, art, makeup, and created with the individual in mind. Though Personal Color Analysis is not new, ebhues was created out of a need to give each person THEIR own best colors – defying the standard industry practice of lumping groups of people together to share a standard array of “best” colors. There was a period of time in which elea blake did utilize this more standard version of Personal Color Analysis, but while sometimes effective in eliminating unflattering colors for individuals, the color groupings were limiting and didn’t provide a scientific framework for color expansion. ebhues organizes the chaos of color for the everyday person. No longer do you have to wonder if a color will suit you, instead you can embrace chroma confidently. ebhues represents the evolution of color. It demystifies an experience that formally only experts could navigate and gives everyone from the amateur to the expert the ability to find the color in every color family that suits them best. It exists outside of trends, color releases, and conformity. ebhues is about you as an individual and embraces the uniqueness that is part of the human experience. Find you color DNA today with our online drapes or an in person consultation. elea blake stands strong in its mission to give every individual the colors that look best on them! So what is ebhues exactly and how does it work? There are a lot of technical explanations for what ebhues is, but basically, it boils down to this: You know how there are days where you do your same morning routine but everyone is complimenting you and telling you how good you look? Well, that has to do with the color you are wearing and how it is interacting with your skin tone. What we have done is create a scientific way to find that color in each hue. We use tested and designed color tools to locate what colors work best with your skin tone. The best way to find your colors is to schedule a draping with Darin Wright, however, we are aware that not everyone can travel to Chattanooga, TN or book with one of our ebhues certified analysts to get our extensive draping service. For this reason, we have developed several thorough online drapes for you to find your best tones. These drapes come with a plethora of assistance – from our walkthroughs in both video and blog form to our eager-to-help staff. Perhaps the idea of ebhues intrigues you but you aren’t sure what purpose it serves. What it can actually DO for you. Eliminates clothing that makes you look sallow or washed-out. Keeps you from wasting money on makeup that doesn't do you justice. Gives you colors to wear in your wardrobe that will make you stand out! Gives you all your best colors so you can cut down on shopping time and only put on outfits that make you look stunning. Helps you pick out colors for your home that will have you looking fabulous and make you feel at ease. Help you make a positive first impression. You may have seen that word floating around. Intentions are what we call the 10 different color families. Before reading about each Intention’s characteristics, it is important to understand that each Intention zone houses a spectrum of different “hues” or what most people understand as “seasons”. Many Personal Color Analysis systems use seasons to differentiate colors based on their undertones and then give an individual a season to stay in. We do not believe that it is the end-all-be-all indicator of what colors you can wear. While there is the possibility that your colors are all contained in one family, it is more likely that your colors will cross over two families or more. This is because throughout our extensive research we have found that while there are two main differentiations in core color identity, warm and cool, a person’s skin tone may be warm but the colors that look best on them are cool. What this means is when a warm skin toned person is looking for makeup colors to wear or more natural tones, they may prefer to wear colors that match their skin tone and therefore are warm. However, when they wish to wear a color that emphasizes their skin tone, they will want to wear cool colors. Keep this in mind when you read about the Intention hues. Power is our red hue. It is called Power in the ebhues system as red is most often equated with power, prowess, and boldness. Strength is our yellow-red hue. Strength in the ebhues system is the infusion of yellow, an energy color, with the color red, a power color. It creates a bold and decisive orange. Strength colors will often be in what many systems term “Spring” or “Autumn” colors as they are pure warm colors, however, it is the hue that makes up almost 98% of the world's skin tone colors. Creativity is our purple hue. It is often equated with wealth or in this case, a wealth of imagination and unique approaches to common problems. Ambition is our purple-red hue. It is the marriage between power and creativity which offers a path to achieving one’s goal that others may miss or not take. Energy is our yellow hue. It is a vibrant warm color with movement and reminds one of the greatest creation of energy, the sun. Determination is our yellow-green hue. It is the combination of yellow, an energy color, and green, a life color. The duo form an alliance that creates ivy crawling forth from urban sprawl and brings to mind the great Jurassic Park motto, “Life finds a way”. Trust is our blue hue. It is the color that most calms and placates the individual. Life is our green hue. It is the color of growth and renewal. Balance is our blue-green hue. It is the delicate balance between Life and Trust. Intuition is our purple-blue hue. It is the blue of Trust and the purple of Creativity to form a trust between the individual and their base instinct. Like biology, each Family in our system is further broken down into the following Genus groups: Pure, Early, Vivid, Subtle, Deep, and Universal. These Genus groupings show the individual what to expect from that color in terms of wearability. If you need a certain seasonal undertone in your Dark colors versus your Light colors, the Genus grouping shows you where the color is for ease of shopping use. What is the Light side or the Dark side of Genus groupings? The Light side is comprised of Pure, Early, and Subtle. The Dark side is comprised of Deep and Vivid colors. The last point to know about Genus groupings is that when a color is marked Universal, particularly in the eyeshadows, it doesn’t mean that he is neither light nor dark. What it does indicate is that the color can be used universally by the person who can best wear that color space. This means that a person who tends to wear lighter colors can take an eyeshadow that is dark but marked universal and use as an eyeliner versus an all over color. Likewise, a person who looks best in dark colors can take a light eyeshadow that is marked universal and wear it as an eye pop or highlight. Everyone needs a mix of color depths to truly create a stunning look. So using this example, you have fallen in love with the color Kitschy, whose code is A11d2o. You love the color so much, you want to see what other colors are similar to and/or related to him. This is where you would take the first 3 digits of the code, A11 and insert them into the search bar on our website. You will then see a list of colors to look through that are listed as A11 colors. You can even go deeper with the code. For example, say you think Kitschy is the best lipstick you have ever purchased. You can then type in “A11d2o”, or the code found on each product under the ebhues Color Reference, into the search bar and receive colors that are matched to that product in different forms. You can do this if you want a blush that matches your lipstick, or you just want that hue in every form because it is perfect for you in every way! Due to the new nature of this option, you may not find exact matches for every color at this time. If this is the case you can always request a color or you can look in the more generalized zone of A11 and use the Genus groupings to filter your results. 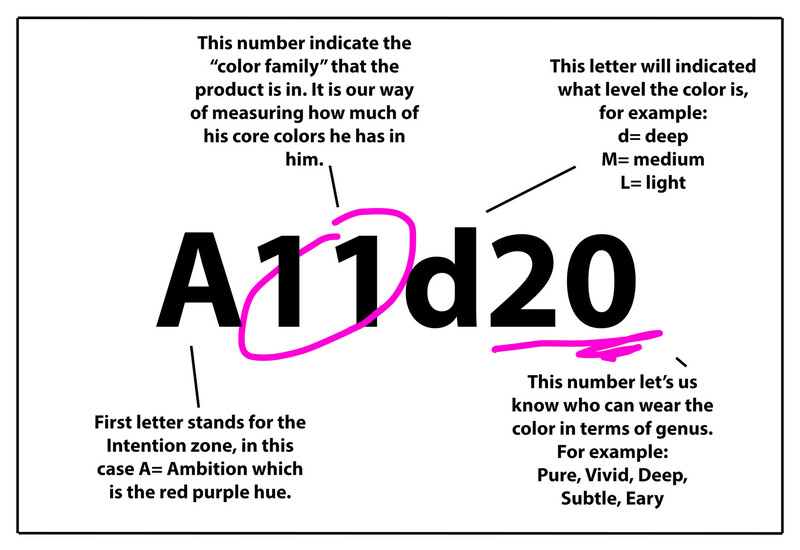 We talked about Genus groupings earlier and now that you have seen the way to discern how much depth a color is in the code you might be a tad bit confused when you see a “d2o” listed as universal when it means there is a good bit of depth to the color. This is because across different mediums the range of the color in the Genus group changes. Meaning a d2o in a lipstick might differ from the d2o in a lipgloss for the reason that a lipstick is more pigmented than a lipgloss. The best thing about our system is we have done all the work for you so that you don’t have to focus on the code, you can just look at its Genus grouping for the information you need. Interested in getting an in-person drape? Find out more here.